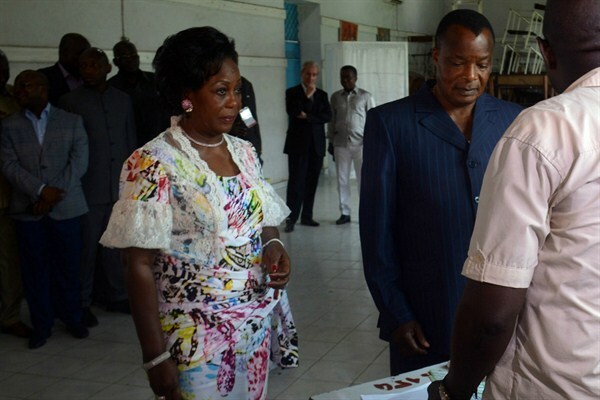 Republic of Congo President Denis Sassou Nguesso stands with his wife, Antoinette, as they cast their ballots, Brazzaville, Republic of Congo, March 20, 2016 (AP photo by John Bompengo). The legislative and local elections currently taking place in the Republic of Congo are intended to complete the process of installing a new government following a deeply divisive constitutional reform process in 2015. But government critics believe the first round of voting that took place Sunday was significant for another reason: It highlighted, they say, authorities’ struggle to confront an array of social and security challenges as President Denis Sassou Nguesso’s political legitimacy weakens.